Is the English Cocker Spaniel right for you? Find your perfect match now! English Cocker Spaniels were bred to be hunting dogs, especially for game birds. One bird in particular, the woodcock, gave the Cocker Spaniel its name. But don't let her name fool you, the English Cocker Spaniel, aka the “Cocker”, has been in the good ol' U.S. of A for a long time and may have come to America on the Mayflower. Stocky and sturdy, English Cocker Spaniels have been a favorite of presidents and television icons alike: Truman and Nixon both owned these dogs; and Oprah has three! This breed also sometimes works in hospitals. In fact, some English Cocker Spaniels have been known to identify cancer in British patients. Originally from England, this medium-sized and medium-energy breed can grow to between 26-34 pounds and lives an average of 12-14 years. The breed is recognized by the American Kennel Club and classified as a member of the Sporting group. WHAT IS AN ENGLISH COCKER SPANIEL'S PERSONALITY LIKE? English Cocker Spaniels are loyal, sweet, affectionate, cheerful, and playful. 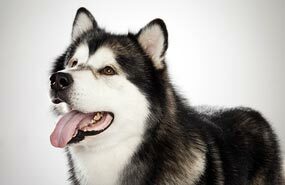 These energetic and enthusiastic dogs are good with families. They get along well with children, other dogs, other pets, and strangers. WHAT IS ENGLISH COCKER SPANIEL BEHAVIOR LIKE? This breed is hard working outdoors and a mellow couch buddy back inside. English Cocker Spaniels are a somewhat active breed who need regular exercise. They're alert and vigilant, but entirely too friendly to be good watchdogs. They can be somewhat prone to barking. HOW EASY IS IT TO TRAIN AN ENGLISH COCKER SPANIEL? 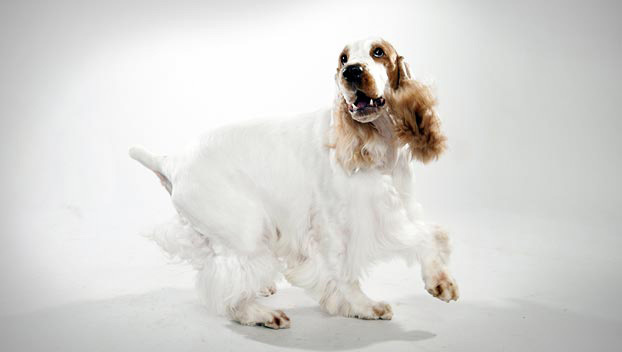 English Cocker Spaniels are responsive and easy to train people-pleasers. It's important to put the work in, though: some can be stubborn; and this breed is slightly aggressive and territorial if not trained well. Training for obedience helps your dog become a good canine citizen and helps keep its busy brain active. Your English Cocker Spaniel will likely respond best to food rewards. HOW MUCH DO ENGLISH COCKER SPANIELS SHED AND WHAT ARE THEIR GROOMING NEEDS? 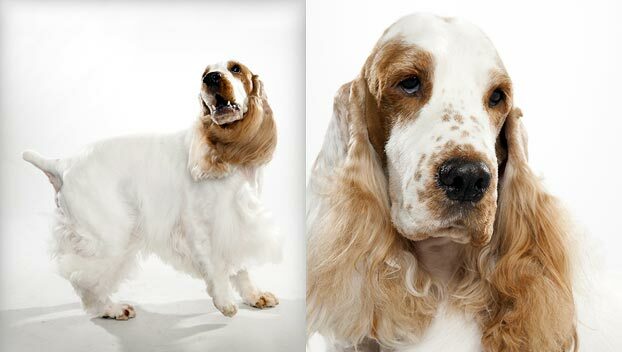 An English Cocker Spaniel's single coat is medium-to-long and silky and its ears are long, feathered, and floppy. Their hair can be wavy or flat. Scientifically speaking, there's no real chemical difference between hair and fur — they're both made of keratin (the same stuff your hair and fingernails are made of). If you're concerned about allergies, choose a breed that doesn't shed much and produces less dander. English Cocker Spaniels are average seasonal shedders who need regular brushing and grooming. Plan to brush and comb your pup several times a week to discourage matting. It's especially important to keep their ears clean and dry to avoid infection. 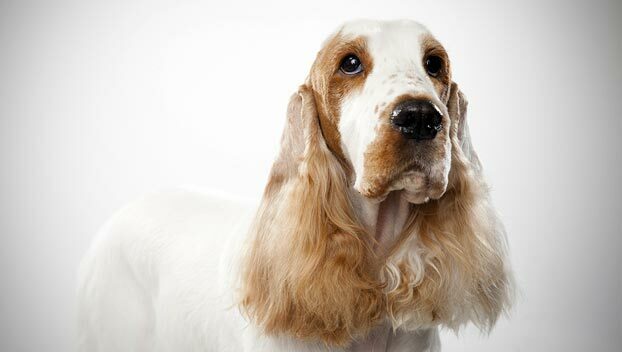 WHAT HEALTH PROBLEMS DO ENGLISH COCKER SPANIELS HAVE? Though a generally healthy breed, English Cocker Spaniels can be prone to ear infections and cataracts. Some also develop orthopedic issues, including patellar luxation and hip dysplasia, and eye ailments. ARE ENGLISH COCKER SPANIELS GOOD FOR PEOPLE WITH ALLERGIES? The American Kennel Club doesn't list English Cocker Spaniels among its breeds recommended for allergy sufferers. You can reduce your furry friend's impact on your allergies with frequent baths and brushings to reduce loose hairs and aggravating proteins in your pet's dander. Use a damp cloth to wipe off your dog after you've been playing outside. Smaller dogs have less surface area, and so produce comparatively less dander than larger breeds — definitely something to keep in mind with a dog like an English Cocker Spaniel! Remember that no breed is 100% hypoallergenic, and any breed can aggravate allergies. WHAT'S AN ENGLISH COCKER SPANIEL'S BEST DAY? Following you to work and taking over as Chief Tail Wagger at your company would be a good fit for this cheerful pup. She'd love greeting everyone and being center of attention for all she meets. Just make sure to provide that work/life balance with an early-morning jog and evening cuddles on the couch. SHOULD I ADOPT AN ENGLISH COCKER SPANIEL? English Cocker Spaniels are sweet, affectionate, loving dogs. Their size and energy level makes them good candidate for apartment living as long as they're given enough exercise. They are equally suited to warm and cold climates and make for fun family dogs when properly socialized. 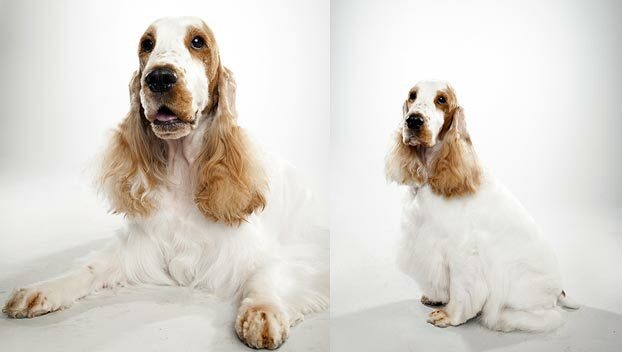 It's hard to imagine a more cheerful canine companion than the English Cocker Spaniel. 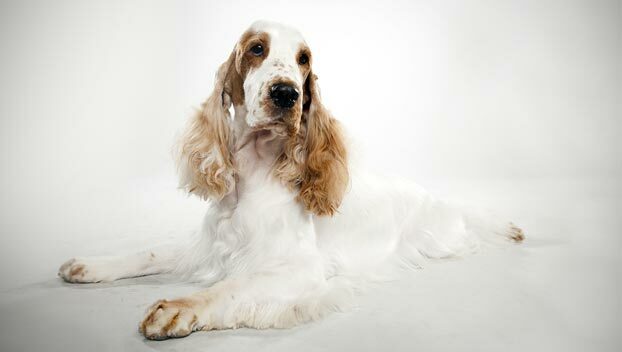 Have you decided that an English Cocker Spaniel is the perfect dog for you? Why not be your new best friend's hero and adopt a rescue! Be sure to check out our article on what to expect when you're adopting a dog or cat.